Rosemary Laing's work has achieved considerable national and international attention and has been included in numerous group exhibitions in Australia and overseas. Working since the mid 1980s, her photomedia based practice can be characterised by its seamless representation of naturalistic detail and hyperreal effect. In 'brownwork' Laing turns her attention to the structures that facilitate air travel. 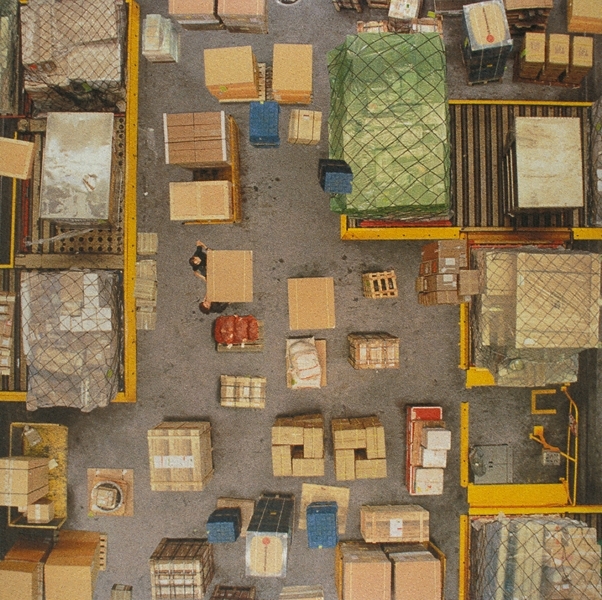 Photographing empty airfreight containers and cargo in transit from above, she examines the industrial and in-between spaces where flight occurs. The processes and machinery that make travel possible are often obscured by the mask of technological efficiency, but here Laing exposes them. Through travel we transcend the boundaries of time and space; far flung destinations become adjacent neighbours and time folds back on itself. Revealing the labour and resources involved from unfamiliar vantage points, Laing dramatises the mechanics of this transitory state.